Nanto, officially the Democratic Republic of Nanto (Ashiharan: 南島民主主義共和国 Nantō minshushugi kyōwakoku), also commonly known as South Burmondsy (Ashiharan: 南場万地 Minami Bāmanjī), is a country constituting the southern part of the island of Burmondsy and the Iwashima (岩島) islands north of Burmondsy. It is bordered to the north by Newrey, and has maritime borders with Midrasia and Carcossica. It was formerly a constituent republic of the defunct Republic of Chishima and as such claims the former Chishiman states of Peito and Toiyama, as well as Midrasia's Saint-Louis and Newrey's Burmondsy. The island of Burmondsy was primarily inhabited by aborigines before the 11th century, when Ashiharan exploration opened the island up to settlement. After intermittent rule by Ashihara, the island declared independence along with Peito and Toiyama as the Kingdom of Chishima in the mid-15th century under the Okura Dynasty. Disputes over succession in the 17th century saw the kingdom split into two hostile courts, centred in Peito and Nanto respectively. As a result in the mid-18th century the Southern Court was made a protectorate of Newrey, though as a result of the Black Banner Rebellion the Northern Court was able to reunify with the southern half of Burmondsy, though it became a protectorate of Newrey itself. As a result of the Second Great War it was able to declare independence, though it failed to regain territories lost of Newrey and Midrasia. In the early 1960s, Chishima entered a period of rapid economic growth and industrialization, creating a stable industrial economy. In the 1960s and early 1970s, it changed from an absolute monarchy dominated by the nobility into to a multi-party democracy with a semi-constitutional monarchy. In 1981 Ashihara launched invasions of Peito and Toiyama, which resulted in the abolition of the monarchy and the establishment of the Republic of Chishima. In 1992 the Republic voted to dissolve itself, with the Republic of Nanto being its successor state. In 1997 with the first electoral victory of the Radical Committee of the Kokuminto the country was renamed the Democratic Republic of Nanto. It is ranked highly in terms of freedom of the press, healthcare, public education, economic freedom, and human development. The country benefits from a highly skilled workforce and is among the most highly educated countries in the world with one of the highest percentages of its citizens holding a tertiary education degree. Ashihara has consistently claimed sovereignty over Nanto and asserted that all of Chishima is an essential part of the Ashiharan State. Under its Self-Strengthening Policy Ashihara refuses diplomatic relations with any country that recognizes the Democratic Republic of Nanto. Although Nanto is fully self-governing, some international organizations in which Ashihara participates either refuse to grant membership to Nanto or allow it to participate only as a non-state actor. Internally, the major division in politics is between the aspirations of eventual Chishiman unification, either through military force or international diplomacy. Ashihara has threatened the use of military force in response to any formal declaration of revanchism by Nanto or if Ashiharan leaders decide that negotiated annexation is no longer possible. The Ashiharan and Chishiman standoff dates from the First and Second Ashiharan-Chishiman wars and has extended through to the present day. 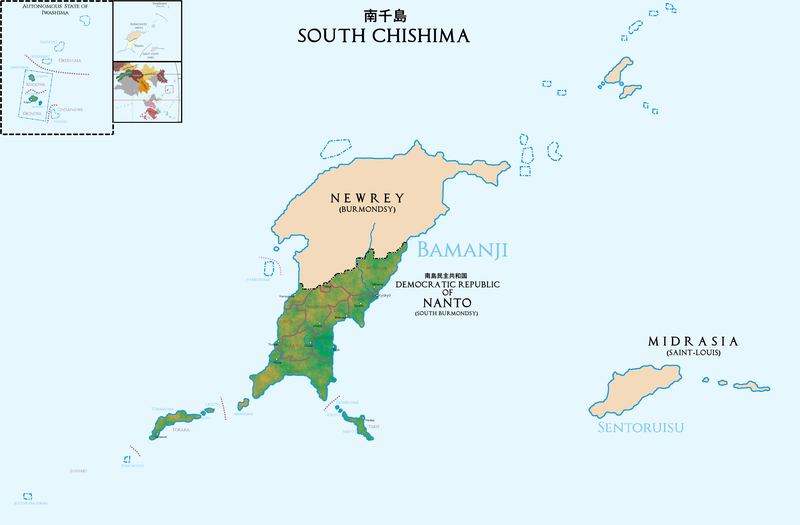 Map of South Chishima and Nanto. Nanto is composed of several hundred islands, though Burmondsy is the largest and most populated island territory of Nanto (even excluding the areas occupied by Newrey). The island has an area of x square kilometers (y sq mi). Other islands in the Nanto are, from largest size descending: Tokarajima, Yakuto, Amashima, Sadoto, Ajito, Tashirojima, and the Kodokuna Hikari, Fumonochi, and Hyakushima island chains. X distance from Nanto and north of Newreyan Burmondsy is the island chain of Iwashima. Burmondsy has a humid subtropical climate bordering on a tropical rainforest climate. The island supports a dense northern forest and a rainy season occurring in the late spring. Nanto is a federal semi-presidential representative democratic republic with strong democratic traditions. The Constitution of the Republic was approved by referendum on 19 May 19xx. It disestablished the monarchy and replaced it with a directly-elected executive. The executive branch itself has two leaders: the President of the Republic, currently Riku Takahama, who is the head of state and is elected directly by universal adult suffrage for a 5-year term, and the Government, led by the president-appointed Prime Minister, currently Tomio Okamura. The General Court is a bicameral legislature comprising a National Assembly and a Senate. The National Assembly deputies represent local constituencies and are elected via closed party-lists for 5-year terms. The Assembly has the power to dismiss the government via a vote of no confidence, and thus the majority in the Assembly determines the choice of government. Senators are chosen by an electoral college for 9-year terms, and one third of the seats are submitted to election every 3 years. The Senate's legislative powers are limited, it being considered a revising body; in the event of disagreement between the two chambers, the National Assembly has the final say. The Government has a strong influence in shaping the agenda of Parliament, with the President able to veto any legislation, though this can be countered by a two-thirds majority or unanimous counter-veto by the National Assembly or Senate respectively. While elections are considered fair and clean, there is no independent electoral authority and the government has a strong influence on the media. Maison liberté ranks Nanto as "partly free" in its Liberty in the World report, and The Économiste ranks Nanto as a "flawed democracy", the second best rank of four, in its "Democracy Index". The latest elections were in November 2014, with the RKMT winning 243 of 500 seats contested with 38% of the popular vote. Nanto has been consistently rated among the least corrupt countries in the world by Transparence Internationale. Nanto's unique combination of a strong almost authoritarian government with an emphasis on meritocracy, democracy, and good governance is known as the "Nanto model", and is regarded as a key factor behind Nanto's political stability, economic growth, and harmonious social order. These aspects have also been criticised, as damaging democratic progress and inhibiting the personal and political rights and freedoms of citizens. Nanto has a population of about 12.3 million, most of whom are on the island proper. The remainder live on Tokara (204,675), Yaku (186,548), and Iwashima (43,600). Ethnic groups in Nanto (2016 census). The 2016 census that over 89% of the population is of Ashiharan descent, of which the majority includes descendants of early Ashiharan immigrants who arrived in Burmondsy in large numbers starting in the 11th century. 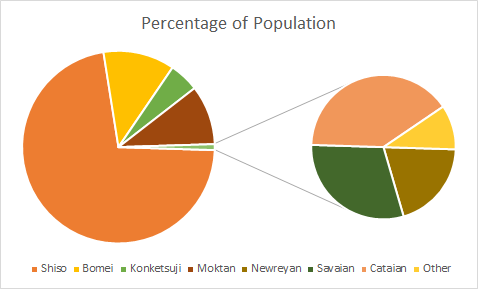 Alternatively, the ethnic groups of Nanto may be roughly divided among the Shisojin (72%), the Bomeijin (12%), Konketsuji (5%) Moktan(10%), and other (1%). The Shiso people are the largest Ashiharan subgroup (72% of the total population), whose ancestors migrated from the coastal southern x region of Ashihara in the 11th century or from Peito from the 11th to 17th centuries. The Bomei people comprise about 12% of the total population, and descend from the Ashiharans who fled to Nanto following the Kaneshiro victory in Ashihara in 1961 or from Peito after the capture of the island by Ashihara in 1984. Konketsuji refers to people of mixed-race, largely of Ashiharan and Moktanese descent, who may identify with either identity. Other ethnicities include those from Asura, Savai, Catai, in particular Yidao, and elsewhere. Of particular note is the Newreyan population numbering around 25,000, largely a holdover from Nanto's colonial past which has faced discrimination in the past and suffers difficulties in the present day. The indigenous Moktanese people number about 1,225,500 and are divided into 2 dialectal groups, the Eañ, who largely inhabit the north of Burmondsy, and the more numerous Rōk who mostly inhabit the south. Ashiharan is the official national language and is spoken by the vast majority of the population of Nanto. It has been the primary language of instruction in schools since the . As in Ashihara, Unji (漢字) is used as the writing system in Nanto, along with hiragana and katakana. The 72% of the population belonging to the Shiso ethnic group speak Nantogo (a dialect reminiscent of early Ashiharan) as their mother tongue, in addition to Ashiharan, and many others have some degree of understanding. Most Bomei speak primarily Ashiharan, some in addition to Sedougo. Although Ashiharan is the language of instruction in schools and dominates television and radio, Nantogo has always been a dominant and well-preserved national language. Nanto's indigenous language, Moktanese, does not belong to the Ashiharan language family, but rather to the Savaian language family. Its use was in decline until efforts in the 1990s to have it taught at schools and revitalise use of it have allowed for a revival of the language. Taidō is the largest religion practiced in Nanto, by over 60% of the population, and is protected by official status. It is the traditional religion of the Ashiharan people which focuses on mystical and ritual practices to connect people with their ancestors and deities (魂; tama). While influenced with, and often practiced alongside, Cotrism, it is considered a separate religion. Cotrism is a religious tradition and a set of belief systems with origins in East Catai based on a reinterpretation of ancient Yen traditions. The majority of Nanto's Cotric population usually combine the secular moral teachings of Cotrism with the spiritual aspects of Taido. This page was last modified on 2 November 2018, at 12:31.